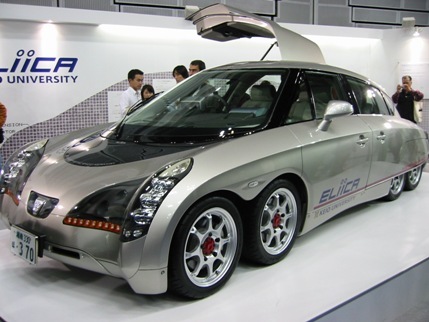 The Eliica, made in Japan, is a true Supercar in every sense of the word. It has over 600 horse power, a quick 0-60 Mph in just four seconds and a has a TOP SPEED of 248 mile per hour. It also has "Gull Wing" rear doors, eight wheels and uses Lithium-ion batteries. The current production price is a cool $250,000.